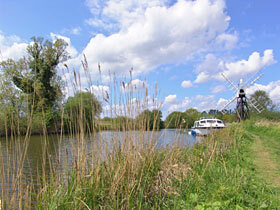 While staying at Grove Farm you can explore the area in many ways you can hire a boat by the hour or day from nearby riverside boat yards and visit many beautiful villages, stop at excellent riverside pubs for good food and real ale or just while away the hours watching the magnificent wildlife on the Norfolk Broads until the sun goes down. Miles of sandy beaches nearby are part of a great coastline offering an attractive blend of wide sandy beaches, sand dunes and cliffs. 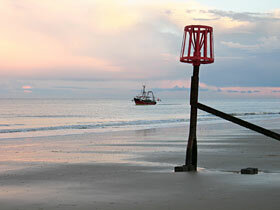 Fun for all the family at the bustling seaside resorts of Hemsby and Great Yarmouth with its famous Golden Mile and the Pleasure Beach. 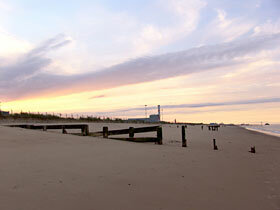 Fine sandy beaches at Sea Palling, Waxham, Horsey, Winterton and Hemsby to name just a few! Norwich, with its Norman castle, two shopping centres and independent retailers located in the historic Norwich Lanes, plus contemporary architecture and history is well worth a visit.